Former Bank of America NT&SA (and its parent, BankAmerica Corporation) ( ), founded and originally headquartered in San Francisco, California , is now headquartered in Charlotte, North Carolina, following the 1998 takeover by the North Carolina-based former NationsBank. The resulting merged bank is now known as Bank of America, NA (and its parent, Bank of America Corporation.) The 2008 takeover of Merrill Lynch completed the transformation of this bank comprehensively to being the number one bank in the United States. 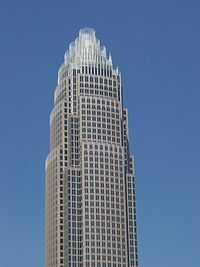 Based in Charlotte, North Carolina , Bank of America is one of the largest financial services companies, largest bank by assets, largest commercial bank by deposits and is the second largest by market capitalization in the United States . The company holds 12.2% of all U.S. deposits. Also, Bank of America is the number one underwriter of global high yield debt, the third largest underwriter of global equity and the ninth largest adviser on global mergers and acquisitions. Bank of America serves clients in more than 150 countries and has a relationship with 99 percent of the U.S. Fortune 500 companies and 83 percent of the Fortune Global 500. The company is a component of the Dow Jones Industrial Average (DJIA) and a member of the Federal Deposit Insurance Corporation (FDIC). At one point considered one of the winners and healthiest survivors of the 2007 credit crisis, plunged in market value due in part to massive losses caused by its purchase of Merrill Lynch. Its Q1 2009 profit was 4.2 billion with 3.7 billion having come from Merrill Lynch. As of September 2009, the total value of B of A's Mortgage and Asset Backed Securities is one of the highest in the banking industry at $264 Billion. Bank of America is one of the Big Four Banks of the United States with Citigroup, JP Morgan Chase and Wells Fargo.It is currently working with Italic textWells Fargo. The Bank of Italy was founded in San Francisco by Amadeo Giannini in 1904, based on catering to immigrants. Amadeo was raised by the Fava/Stanghellini family when his father was shot while trying to collect on a $10.00 debt. When the 1906 San Francisco earthquake struck, Giannini was able to get all of the deposits out of the bank building and away from the fires. Because San Francisco's banks were in smoldering ruins and unable to open their vaults, Giannini was able to use the rescued funds to start lending within a few days of the disaster. From a makeshift desk of a few planks over two barrels, he lent money to anyone who was willing to rebuild. He took great pride in later years that all of these loans were repaid. In 1922, Giannini established Bank of America and Italy in Italy by buying Banca dell'Italia Meridionale, itself only established in 1918. March 7, 1927, Mr. Giannini consolidated his Bank of Italy (101 branches) with the then newly formed Liberty Bank of America (175 branches). The result was the Bank of Italy National Trust & Savings Association with capital of $30,000,000, resources of $115,000,000. In 1928, A. P. Giannini merged with Bank of America Los Angeles and consolidated it with his other bank holdings to create what would become the largest banking institution in the country. He renamed his Bank of Italy November 3, 1930, calling it Bank of America. The merger was completed in early 1929 and took the name Bank of America. The combined company was headed by Giannini with Monnette serving as co-Chair. Giannini sought to build a national bank, expanding into most of the western states as well as into the insurance industry, under the aegis of his holding company, Transamerica Corporation. In 1953, regulators succeeded in forcing the separation of Transamerica Corporation and Bank of America under the Clayton Antitrust Act. The passage of the Bank Holding Company Act of 1956 prohibited banks from owning non-banking subsidiaries such as insurance companies. Bank of America and Transamerica were separated, with the latter company continuing in the insurance business. However, federal banking regulators prohibited Bank of America's interstate banking activity, and Bank of America's domestic banks outside California were forced into a separate company that eventually became First Interstate Bancorp, which was acquired by Wells Fargo and Company in 1996. It was not until the 1980s with a change in federal banking legislation and regulation that Bank of America was again able to expand its domestic consumer banking activity outside California. Following the passage of the Bank Holding Company Act of 1967, BankAmerica Corporation was established for the purpose of owning Bank of America and its subsidiaries. BankAmerica expanded outside California in 1983 with its acquisition of Seafirst Corporation of Seattle , Washington , and its wholly owned banking subsidiary, Seattle-First National Bank. Seafirst was at risk of seizure by the federal government after becoming insolvent due to a series of bad loans to the oil industry. BankAmerica continued to operate its new subsidiary as Seafirst rather than Bank of America until the 1998 merger with NationsBank. BankAmerica was dealt huge losses in 1986 and 1987 by the placement of a series of bad loans in the Third World, particularly in Latin America. The company fired its CEO, Sam Armacost. Though Armacost blamed the problems on his predecessor, A.W. Clausen, Clausen was appointed to replace Armacost. The losses resulted in a huge decline of BankAmerica stock, making it vulnerable to a hostile takeover. First Interstate Bancorp of Los Angeles (which had originated from banks once owned by BankAmerica), launched such a bid in the fall of 1986, although BankAmerica rebuffed it, mostly by selling operations. It sold its FinanceAmerica subsidiary to Chrysler and the brokerage firm Charles Schwab and Co. back to Mr. Schwab. It also sold Bank of America and Italy to Deutsche Bank. By the time of the 1987 stock market crash, BankAmerica's share price had fallen to $8, but by 1992 it had rebounded mightily to become one of the biggest gainers of that half-decade. BankAmerica's next big acquisition came in 1992. The company acquired its California rival, Security Pacific Corporation and its subsidiary Security Pacific National Bank in California and other banks in Arizona , Idaho , Oregon , and Washington (which Security Pacific had acquired in a series of acquisitions in the late 1980s). This was, at the time, the largest bank acquisition in history. Federal regulators, however, forced the sale of roughly half of Security Pacific's Washington subsidiary, the former Rainier Bank, as the combination of Seafirst and Security Pacific Washington would have given BankAmerica too large a share of the market in that state. The Washington branches were divided and sold off to West One Bancorp (now U.S. Bancorp) and KeyBank. Later that year, BankAmerica expanded into Nevada by acquiring Valley Bank of Nevada. In 1994, BankAmerica acquired the Continental Illinois National Bank and Trust Co. of Chicago , which had become federally owned as part of the same oil industry debacle emanating from Oklahoma City's Penn Square Bank, that had brought down numerous financial institutions including Seafirst. At the time, no bank had the resources to bail out Continental, so the federal government operated the bank for nearly a decade. Illinois at that time regulated branch banking extremely heavily, so Bank of America Illinois was a single-unit bank until the 21st century. BankAmerica moved its national lending department to Chicago in an effort to establish a financial beachhead in the region. These mergers helped BankAmerica Corporation to once again become the largest U.S. bank holding company in terms of deposits, but the company fell to second place in 1997 behind fast-growing NationsBank Corporation, and to third in 1998 behind North Carolina's First Union Corp. In 1997, BankAmerica lent D. E. Shaw & Companyy., a large hedge fund, $1.4bn so that the hedge fund would run various businesses for the bank. However, D.E. Shaw suffered significant loss after the 1998 Russia bond default. BankAmerica was acquired by NationsBank later that year in October. The purchase of BankAmerica Corp. by the NationsBank Corporation was the largest bank acquisition in history at that time. While the deal was technically a purchase of BankAmerica Corporation by NationsBank, the deal was structured as merger with NationsBank renamed to Bank of America Corporation, and Bank of America NT&SA changing its name to Bank of America, N.A. as the remaining legal bank entity. The bank still operates under Federal Charter 13044, which was granted to Giannini's Bank of Italy on March 1, 1927. However, SEC filings before 1998 are listed under NationsBank, not BankAmerica. Following the US$64.8 billion acquisition of BankAmerica by NationsBank, the resulting Bank of America had combined assets of US$570 billion, as well as 4,800 branches in 22 states. Despite the mammoth size of the two companies, federal regulators insisted only upon the divestiture of 13 branches in New Mexico , in towns that would be left with only a single bank following the combination. This is because branch divestitures are only required if the combined company will have a larger than 25 percent FDIC deposit market share in a particular state or 10 percent deposit market share overall. In 2001, Bank of America CEO and chairman Hugh McColl stepped down and named Ken Lewis as his successor. Lewis's greater focus on financial discipline and efficiency contrasted greatly with the expansionary mergers and acquisition strategy of his predecessor. In 2004, Bank of America announced it would purchase Boston-based bank FleetBoston Financial for $47 billion in cash and stock. By merging with Bank of America, all of its banks and branches were given the Bank of America logo. At the time of merger, FleetBoston was the seventh largest bank in United States with $197 billion in assets, over 20 million customers and revenue of $12 billion. On 30 June 2005, Bank of America announced it would purchase credit card giant MBNA for $35 billion in cash and stock. The Federal Reserve Board gave final approval to the merger on 15 December 2005, and the merger closed on 1 January 2006. The acquisition of MBNA provided Bank of America a leading credit card issuer at home and abroad. The combined Bank of America Card Services organization, including the former MBNA, had more than 40 million U.S. accounts and nearly $140 billion in outstanding balances. Under Bank of America the operation was renamed FIA Card Services. In May 2006, Bank of America and Banco Itaú (Investimentos Itaú S.A.) entered into an acquisition agreement through which Itaú agreed to acquire BankBoston's operations in Brazil and was granted an exclusive right to purchase Bank of America's operations in Chile and Uruguay . A deal was signed in August 2006 under which Itaú agreed to purchase Bank of America's operations in Chile and Uruguay. Prior to the transaction, BankBoston's Brazilian operations included asset management, private banking, a credit card portfolio, and small, middle-market, and large corporate segments. It had 66 branches and 203,000 clients in Brazil. BankBoston in Chile had 44 branches and 58,000 clients and in Uruguay it had 15 branches. In addition, there was a credit card company, OCA, in Uruguay, which had 23 branches. BankBoston N.A. in Uruguay, together with OCA, jointly served 372,000 clients. While the BankBoston name and trademarks were not part of the transaction, as part of the sale agreement, they cannot be used by Bank of America in Brazil, Chile or Uruguay following the transactions. Hence, the BankBoston name has disappeared from Brazil, Chile and Uruguay. The Itaú stock received by Bank of America in the transactions has allowed Bank of America's stake in Itaú to reach 11.51%. Banco de Boston de Brazil had been founded in 1947. On 20 November 2006, Bank of America announced the purchase of The United States Trust Company for $3.3 billion, from the Charles Schwab Corporation. US Trust had about $100 billion of assets under management and over 150 years of experience. The deal closed 1 July 2007. On September 14, 2007, Bank of America won approval from the Federal Reserve to acquire LaSalle Bank Corporation from Netherlands's ABN AMRO for $21 billion. With this combination Bank of America will have 1.7 trillion in assets. A Dutch court blocked the sale until it was later approved in July. The acquisition was completed on October 1, 2007. The deal increased Bank of America's presence in Illinois , Michigan , and Indiana by 411 branches, 17,000 commercial bank clients, 1.4 million retail customers, and 1,500 ATMs. Bank of America has become the largest bank in the Chicago market with 197 offices and 14% of the deposit share, passing up JPMorgan Chase. LaSalle Bank and LaSalle Bank Midwest branches adopted the Bank of America name on 5 May 2008. On August 23, 2007 the company announced a $2 billion repurchase agreement for Countrywide Financial. This purchase of preferred stock was arranged to provide a return on investment of 7.25% per annum and provided the option to purchase common stock at a price of $18 per share. Following that initial investment, on January 11, 2008, Bank of America announced that they would buy Countrywide Financial for $4.1 billion.This acquisition, which closed on July 1, 2008, gave the bank a substantial market share of the mortgage business, and access to Countrywide's expertise, technology, and employees for servicing mortgages.The acquisition was seen as preventing the potential of bankruptcy for Countrywide. Countrywide, however, denied that it was close to bankruptcy. Countrywide provides mortgage servicing for nine million mortgages valued at $1.4 trillion USD as of December 31, 2007.However, Countrywide is under FBI investigation due to possible fraud in home loans and mortgages, therefore Bank of America states that by 2009 they will only be "officially" affiliated to Countrywide. On July 1, 2008, Bank of America Corporation completed its purchase of Countrywide Financial Corporation. This purchase made it the USA's leading mortgage originator and servicer, controlling between 20 to 25 percent of the home loan market. The deal was structured to merge Countrywide with the Red Oak Merger Corporation, which Bank of America created as an independent subsidiary. It has been suggested that the deal was structured this way to prevent a potential bankruptcy stemming from large losses in Countrywide hurting the parent organization by keeping Countrywide bankruptcy remote. To change the brand's business culture, Countrywide Financial has now become Bank of America Home Loans. On September 15, 2008, Bank of America announced its intentions to purchase Merrill Lynch & Co., Inc. in an all-stock deal worth approximately $50 billion, about 86% of the Bank of America stock price at close. Merrill Lynch was at the time within days of collapse, and the acquisition effectively saved Merrill from bankruptcy. Around the same time Bank of America was reportedly also in talks to purchase Lehman Brothers, however a lack of government guarantees caused the bank to abandon talks with Lehman. Lehman Brothers filed for bankruptcy the same day Bank of America announced its plans to acquire Merrill Lynch. This acquisition made Bank of America the largest financial services company in the world. Temasek Holdings, the largest shareholder of Merrill Lynch & Co., Inc., briefly became one of the largest shareholders of Bank of America,, with a 3% stake. However, taking a loss Reuters estimated at $3Bn, the Singapore sovereign wealth fund sold its whole stake in BofA in 1st q., 2009. Shareholders of both companies approved the acquisition on December 5, 2008, and the deal closed January 1, 2009. BofA had planned to retain various members of Thain's management team after the merger. However, after Thain was removed from his position, most of his allies left. The departure of Nelson Chai, who had been named Asia-Pacific president, left just one of Thain's hires in place, Tom Montag as head of sales and trading. The Bank, in its January 16, 2009 earnings release, revealed massive losses at Merrill Lynch in the fourth quarter, which necessitated an emergency government bailout of the Bank to keep it solvent. Merrill recorded an operating loss of $21.5 billion in the quarter, mainly in its sales and trading operations, led by Tom Montag. The Bank also disclosed it tried to abandon the deal in December after the extent of Merrill's trading losses surfaced, but was compelled to complete the merger by the U.S. government. The Bank's stock price sank to $7.18, its lowest level in 17 years, after announcing earnings and the Merrill mishap. The market capitalization of Bank of America, including Merrill Lynch, was then $45 billion, less than the $50 billion it offered for Merrill just four months earlier, and down $108 billion from the merger announcement. Bank of America CEO Kenneth Lewis testified before Congress that he had some misgivings about the acquisition of Merrill Lynch, and that federal officials pressured him to proceed with the deal or face losing his job and endangering the bank's relationship with federal regulators. Lewis' statement is backed up in internal emails subpoenaed by Republican lawmakers on the House Oversight Committee. In one of the emails, Richmond Federal Reserve President Jeffrey Lacker threatened that if the acquisition did not go through, and later Bank of America were forced to request federal assistance, the management of Bank of America would be "gone". Other emails, read by Congressman Dennis Kucinich during the course of Lewis' testimony, state that Mr. Lewis had foreseen the outrage from his shareholders that the purchase of Merrill would cause, and asked government regulators to issue a letter stating that the government had ordered him to complete the deal to acquire Merrill. Lewis, for his part, states he doesn't recall requesting such a letter. On August 3, 2009, BofA agreed to pay a $33 million fine, without admission or denial of charges, to the U.S. Securities and Exchange Commission (SEC) over the non-disclosure of an agreement to pay up to $5.8 billion of bonuses at Merrill. BofA approved the bonuses before the merger but did not disclose them to its shareholders when the shareholders were considering approving the Merrill acquisition, in December 2008. The issue was originally investigated by New York State Attorney General Andrew Cuomo, who commented after the suit and announced settlement that "the timing of the bonuses, as well as the disclosures relating to them, constituted a 'surprising fit of corporate irresponsibility'" and "our investigation of these and other matters pursuant to New York’s Martin Act will continue." Kucinich commented at the same time that "This may not be the last fine that Bank of America pays for how it handled its merger of Merrill Lynch." A federal judge, Jed Rakoff, in an unusual action, refused to approve the settlement on August 5.A first hearing before the judge on August 10 was at times heated, and he was "sharply critic[al]" of the bonuses. David Rosenfeld represented the SEC, and Lewis J. Liman, son of Arthur L. Liman, represented BofA. The actual amount of bonuses paid was $3.6 billion, of which $850 million was "guaranteed" and the rest was shared amongst 39,000 workers who received average payments of $91,000; 696 people received more than $1 million in bonuses; at least one person received a more than $33 million bonus. On September 14, the judge rejected the settlement and told the parties to prepare for trial to begin no later than February 1, 2010. "The judge focused much of his criticism on the fact that the fine in the case would be paid by the bank’s shareholders, who were the ones that were supposed to have been injured by the lack of disclosure. 'It is quite something else for the very management that is accused of having lied to its shareholders to determine how much of those victims’ money should be used to make the case against the management go away,' the judge wrote. ... The proposed settlement, the judge continued, 'suggests a rather cynical relationship between the parties: the S.E.C. gets to claim that it is exposing wrongdoing on the part of the Bank of America in a high-profile merger; the bank’s management gets to claim that they have been coerced into an onerous settlement by overzealous regulators. And all this is done at the expense, not only of the shareholders, but also of the truth.'" Investigations also continue in The House Committee on Government Oversight and Reform. Bank of America received US $20 billion in federal bailout from the US government through the Troubled Asset Relief Program (TARP) on 16 January 2009 and also got guarantee of US $118 billion in potential losses at the company. This was in addition to the $25 billion given to them in the Fall of 2008 through TARP. The additional payment was part of a deal with the US government to preserve Bank of America's merger with the troubled investment firm Merrill Lynch. Since then, members of the US Congress have expressed considerable concern about how this money has been spent, especially since some of the recipients have been accused of misusing the bailout money. The Bank's CEO, Ken Lewis, was quoted as claiming "We are still lending, and we are lending far more because of the TARP program." Members of the US House of Representatives, however, were skeptical and quoted many anecdotes about loan applicants (particularly small business owners) being denied loans and credit card holders facing stiffer terms on the debt in their card accounts. According to a March 15, 2009 article in The New York Times, Bank of America received an additional $5.2 billion in government bailout money, channeled through American International Group. As a result of its federal bailout and management problems, The Wall Street Journal reported that the Bank of America is operating under a secret “memorandum of understanding” (MOU) from the US government that requires it to ”overhaul its board and address perceived problems with risk and liquidity management.” With the federal action, the institution has taken several steps, including arranging for six of its directors to resign and forming a Regulatory Impact Office. Bank of America faces several deadlines in July and August and if not met, could face harsher penalties by federal regulators. Bank of America did not respond to The Wall Street Journal story. Bank of America generates 90% of its revenues in its domestic market and continues to buy businesses in the US. The core of Bank of America's strategy is to be the number one bank in its domestic market. It has achieved this through key acquisitions. Global Consumer and Small Business Banking (GC&SBB) is the largest division in the company, and deals primarily with consumer banking and credit card issuance. The acquisition of FleetBoston and MBNA significantly expanded its size and range of services, resulting in about 51% of the company's total revenue in 2005. It competes directly with the retail banking divisions of Citigroup and JPMorgan Chase. The GC&SBB organization includes over 6,100 retail branches and over 18,700 ATMs across the United States. Bank of America is a member of the Global ATM Alliance, a joint venture of several major international banks that allows customers of the banks to use their ATM card or check card at another bank within the Global ATM Alliance with no ATM access fees when traveling internationally. Other participating banks are Barclays (United Kingdom ), BNP Paribas (France ), China Construction Bank (China ), Deutsche Bank (Germany ), Santander Serfin (Mexico ), Scotiabank (Canada ) and Westpac (Australia and New Zealand ). This feature is restricted to withdrawals using a debit card, though credit card withdrawals are still subject to cash advance fees and foreign currency conversion fees. Additionally, some foreign ATMs use Smart Card technology and may not accept non-Smart Cards. Bank of America offers banking and brokerage products as a result of the acquisition of Merrill Lynch. Savings programs such as "Add it Up" and "Keep the Change" have been well received and are a reflection of the product development banks have taken during the 2008 recession. Bank of America, N.A is a nationally chartered bank, regulated by the Office of the Comptroller of the Currency, Department of the Treasury. Global Corporate and Investment Banking (GCIB), also known as Banc of America Securities LLC, provides mergers and acquisitions advisory, underwriting, capital markets, as well as sales & trading in fixed income and equities markets. Its strongest groups include Leveraged Finance, Syndicated Loans, and mortgage-backed securities. It also has one of the largest research teams on Wall Street . Bank of America Securities LLC is based in New York City , with major offices also located in Charlotte , Chicago , San Francisco , Tokyo , Frankfurt , London , and Mumbai . Ken Lewis, the ambitious http://www.bloomberg.com/apps/news?pid=20601109&sid=aMzHGkCEv2P0, headlined Brokers Disdain Toaster Salesmen in Bank America deal, referring to the history of banks giving out various bonuses, typically housekeeping items (stereotyped as toasters) to customers opening new accounts, often merely transferred from another bank that in turn, a year or so before had also given a new-account incentive. The article, in a further putdown, also calls Lewis a "onetime shoe salesman" although, later on, to be fair, it clarifies this: (after his father died) "From about the time he entered junior high school, he worked odd jobs, peddling Christmas cards door-to-door and selling shoes to make a 36-cent commission per pair." chief executive who masterminded the bank's expansion into exotic new businesses including GCIB, bluntly ruled out any further acquisitions in its investment banking division. "I've had all of the fun I can stand in investment banking at the moment," he told analysts. Global Wealth and Investment Management manages assets of institutions and individuals. It is among the 10 largest U.S. wealth managers (ranked by private banking assets under management in accounts of $1 million or more as of June 30, 2005). In July 2006, Chairman Ken Lewis announced that GWIM's total assets under management exceeded $500 billion. GWIM has five primary lines of business: Premier Banking & Investments (including Bank of America Investment Services, Inc.), The Private Bank, Family Wealth Advisors, Columbia Management Group, and Bank of America Specialist. Bank of America has recently spent $675 million building its US investment banking business and is looking to become one of the top five investment banks worldwide. "Bank of America already has excellent relationships with the corporate and financial institutions world. Its clients include 98% of the Fortune 500 companies in the US and 79% of the Global Fortune 500. These relationships, as well as a balance sheet that most banks would kill for, are the foundations for a lofty ambition." Bank of America is currently constructing a massive new headquarters for its New York City operations. The skyscaper will be located on 42nd Street and Avenue of the Americas , at Bryant Park , and will feature state of the art, environmentally-friendly technology throughout its 1.2 million square feet (111,484 m²) of office space. The building will be the headquarters for the company's investment banking division, and will also host most of Bank of America's New York-based staff. In 2005, Bank of America acquired a 9% stake in China Construction Bank, China's second largest bank, for $3 billion. It represented the company's largest foray into China's growing banking sector. Bank of America currently has offices in Hong Kong , Shanghai, and Guangzhou and is looking to greatly expand its Chinese business as a result of this deal. In 2008 Bank of America was awarded Deal of the Year - Project Finance Deal of the Year at the 2008 ALB Hong Kong Law Awards. Bank of America has invested in India as an emerging market. Currently, Bank of America maintains branches in Mumbai , Chennai , Calcutta , New Delhi , and Bangalore . For the fiscal year ending March 31, 2006, Bank of America reported an 80% increase in net profit. Bank of America's Global Corporate and Investment Banking spans the Globe with divisions in United States, Europe, and Asia. The U.S. headquarters are located in New York, European headquarters are based in London, and Asia's headquarters are split between Singapore & Hong Kong. William Boardman, ex-chairman of Visa International Inc.
Donald Powell, former chairman of the Federal Deposit Insurance Corp.
John T. Collins, Chief Executive Officer, The Collins Group, Gary L. Countryman, Chairman Emeritus, Liberty Mutual Group, and William Barnet III, Chairman, President and Chief Executive Officer, The Barnet Company, and mayor of Spartanburg, SC, resigned from the Board in July, 2009, pushing the total of departures to ten since April, 2009, reported Bloomberg News. Barnet, Collins and Countryman had joined the Board after the 2004 purchase of FleetBoston Corp. Others to depart the Board in 2009 included Tommy Franks, Retired General, United States Army (joined Board in 2005); Admiral Joseph Prueher; Jackie M. Ward, Retired Chairman/CEO, Computer Generation; Patricia E. Mitchell, President and Chief Executive Officer, The Paley Center for Media; O. Temple Sloan, Jr., lead director of BofA and Chairman, General Parts International; and Robert Tillman, retired CEO at Lowe's Cos. Meredith Spangler, Trustee and Board Member, resigned after reaching 72, the bank’s age limit. Four members—Bies, Boardman, Powell, and Jones—were named to the Board in June, 2009. Membership totalled 13 by August, 2009. More additions were expected, according to the Bloomberg report. In addition to its new eco-friendly office tower in Manhattan, Bank of America has pledged to spend billions on commercial lending and investment banking for projects that it considers "green." The corporation supplied all of its employees with cash incentives to buy hybrid vehicles, and began providing mortgage loan breaks for customers whose homes qualified as energy efficient. In 2007, Bank of America partnered with Brighter Planet to offer an eco-friendly credit card, and later a debit card, which help build renewable energy projects with each purchase. The corporation is also constructing the One Bank of America Center in Downtown Charlotte. The tower, and the accompanying hotel, will be a LEED-certified building. Bank of America has also donated money to help health centers in Massachusetts and made donations to help homeless shelters in Miami. In 2004 the bank pledged $750 billion over a ten-year period for community development lending and investment. The company had delivered more than $230 billion against a ten-year commitment of $350 billion made in 1998 to provide affordable mortgage, build affordable housing, support small business and create jobs in disadvantaged neighborhoods. Bank of America was named for the 19th year as one of the "100 Best Companies for Working Mothers" in 2007 by Working Mother magazine. In 2006 Bank of America was one of the first companies inducted into Working Mother magazine's Hall of Fame. In 2007, DiversityInc ranked Bank of America as the number one company for diversity in this prestigious list and placed as a top employer for executive women, Hispanics, Asian Americans and for GLBT executives, as well as number one for recruitment and retention, and number six for supplier diversity. IT Senior Management Forum (ITSMF) recognized Bank of America as the "2007 Organization of the Year." This award is presented annually for leadership in the areas of developing and embracing a diverse workforce. National Black MBA Association awarded Bank of America the "2006 Company of the Year" for recruiting, retaining and providing advancement opportunities for blacks in the workplace. It also recognized Bank of America's Managing Director, Deputy Head of Global Investment Banking Lewis Warren, Jr. as one of the "75 Most Powerful Blacks on Wall Street." Bank of America was named the number one company for Hispanics by Hispanics Business Magazine in 2006. Latina Style continues to rank Bank of America in their Top 15 for its 50 Best Companies for Latinas, which measures companies based on recruitment, retention and advancement opportunities for Latinas. Human Rights Campaign 2006 Corporate Equality Index gave Bank of America a 100% rating for its support of gay, lesbian, bisexual and transgender associates. Recent controversy comes from a New York lawsuit that Manhattan attorney, Jacob Zamansky, has filed that claims Bank of America was involved in a $413 million Ponzi scheme. The lawsuit alleges that the bank “aided and abetted, encouraged, and rendered substantial assistance” to the $413 million fraud that federal prosecutors say was perpetrated by Nicholas Cosmo and his company Agape World. An amended lawsuit against the Bank of America, charged that it breached its ‘know your customer’ obligations by allowing a convicted felon to manage millions through about two dozen BofA accounts. The lawsuit also claims that a Bank of America branch in West Hempstead, approximately 20 miles from the Agape office, assigned more than one bank employee to work out of Cosmo’s office in Hauppauge and supplied direct access to the bank’s accounts and systems. "Bank of America ignored banking compliance standards and did not file any suspicious activity reports as $400 million was run through numerous BofA accounts by a convicted felon," says Jacob Zamansky of Zamansky & Associates, one the plaintiff's lawyers in the lawsuit. "This case highlights the role of financial institutions in assisting Ponzi schemes." The complaint accuses Bank of America of housing 13 accounts used by Cosmo and his brokers, some of whom had criminal records of their own. The bank did nothing to intervene as investor money was commingled, wired to commodities futures brokerages and used to pay off Cosmo's personal expenses, according to the complaint. The Bank of Italy in Italy was created in 1893 through the merger of 3 of the 6 banks at the time: Banca Nazionale nel Regno d'Italia and 2 Tuscan banks. In 1986 Deutsche Bank AG acquired 100% of Banca d’America e d’Italia, a bank established in Naples in 1917 following the name change of Banca dell'Italia Meridionale. In 1918 the Bank of Italy opened a Delegation in New York, to follow American political, economic and financial affairs more closely; together with the London Delegation, this was the first permanent overseas office opened by the Bank, at a time when the foundations were being laid for the restructuring of the international money market. 1929 [...] -- The Vatican awards Knighthood in the Order of Malta to two San Franciscans, Transamerica Corporation President Amadeo Peter Giannini and American Trust Company President John S. Drum. The knighthood is the oldest and most distinguished decoration of laymen conferred by the Catholic Church. Transamerica Corporation, a corporation of Delaware, has petitioned this court to review an order of the Board of Governors of the Federal Reserve System entered against it under Section 11 of the Clayton Act, 15 U.S.C.A. § 21, to enforce compliance with Section 7 of the Act, 15 U.S.C.A. § 18. "Singapore's Temasek defends costly Bank of America exit" by Kevin Lim and Saeed Azhar, Reuters, May 22, 2009. Retrieved 8/3/09. "BofA Settles S.E.C. Suit Over Merrill Deal" by Zachery Kouwe, DealBook blog, The New York Times, Aug. 3, 2009. Retrieved 8/3/09. "Judge blocks Bank of America-SEC bonus settlement" by Jonathan Stempel, Reuters, 8/6/09. Retrieved 8/7/09. "Judge Attacks Merrill Pre-Merger Bonuses" by Louise Story, The New York Times, August 10, 2009 (Aug. 11, 2009, p. B1 of NY ed.). Retrieved 8/11/09. "Judge Rejects Settlement Over Merrill Bonuses" by Louise Story, The New York Times, September 14, 2009. Retrieved 9/14/09. "Five big banks form Global ATM Alliance", ATMmarketplace.com. January 9, 2002. Accessed June 22, 2007. Company Web page Retrieved 8/2/09. "Former Compass CEO Jones returns to Balch and Bingham" by Crystal Jarvis, April 18, 2008. Retrieved 8/2/09. "Bank of America Says Three Directors Quit as Exodus Totals 10" by David Mildenberg, Bloomberg.com, August 1, 2009. Retrieved 8/1/09.